Our incredible journey to Jesus. “It was a wonder to see how God had led Markus from Holland all the way to Mongolia to attend an evangelistic meeting conducted by someone from the United States serving in Asia. It was an honor to baptize him.”—Bob Folkenberg Jr.
Ulaanbaatar, Mongolia. What may have been just another capital city to visit on our travels became a place that we will remember for the rest of our lives. 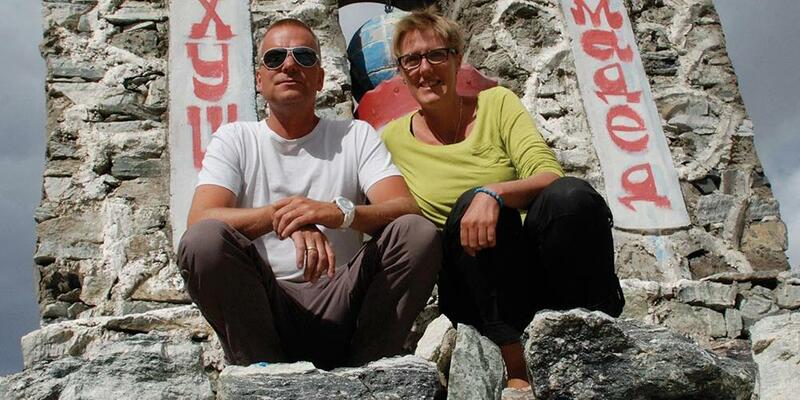 We are Markus and Belinda, a Dutch couple who loves to travel. We started with short trips in Holland and to neighboring countries but, as time went on, we discovered overlanding—traveling over land with our own means of transport. No longer restrained by the fixed routes of public transport, we now journey longer and farther, driving wherever we want and stopping whenever we want. We absolutely love it, and it has become our passion! In 2007, we quit our jobs and embarked on a 14-month journey. We drove from Holland to Cape Town, South Africa, and then shipped our car to India to continue our adventure. We visited countless fascinating places and were often stunned by the beauty of God’s creation. It was a dream come true. However, being away from home also meant being away from everything familiar. We were strangers in places where we did not know our way and could not speak the language. We had no choice but to trust in God and the men and women He brought into our path. It was an incredible experience. Never before had we felt so guided. Just as we were running out of water in the Sudanese desert, God provided the best water we had ever tasted. In an area in Northern Ethiopia, where none of the villages had power, God led us to a Chinese construction site with generators and welding equipment where we could repair our broken shock absorber. Day in and day out, we experienced God’s providence and were often helped before we even asked. In 2008, we returned home, and our lives continued much as they had before except for one wonderful difference. Markus had become a Christian! We talked freely and at length about God and religion. We even joined a Bible study group. The subject of baptism came up more than once at our meetings, but Markus wasn’t ready. “Maybe I’ll do that down the road when I have an opportunity,” he replied, not knowing how God would lead. In early 2014, we quit our jobs again to embark on a journey from Holland to Thailand. After five months on the road, we arrived in Ulaanbaatar, Mongolia, a week earlier than we had planned. Our timing turned out to be perfect. An evangelistic series was taking place in the local Adventist churches as part of the Adventist Church’s Mission to the Cities initiative. We searched the Internet and found the address for the Seventh-day Adventist Central Church. It was the first church that we had decided to visit since leaving Holland. Providentially, we found an English-speaking taxi driver who took us to the church, where we were made to feel like part of the family. For the first time since leaving home, we didn’t feel like tourists. When we entered the sanctuary, we discovered that we were just in time for the opening meeting of the series. We listened intently as Pastor Bob Folkenberg Jr. spoke about Jesus, the Holy Ghost, and baptism. Ignoring the Holy Ghost speaking so clearly to our hearts wasn’t an option anymore, and on Friday evening Markus asked Pastor Folkenberg if he would baptize him the next day. It was a special moment for all of us. Markus and Belinda Keizer have known each other since they were teenagers. They have visited some 70 countries together.